The sport of lacrosse, the oldest-known athletic game played in North America, was originally not a sport at all. Called "baggataway" by the North American Indian tribes that founded and played it long before Columbus discovered the New World, lacrosse originated as a ceremonial religious rite. Virtually all tribes of southern Canada and the United States, except those in the Southwest, played some type of lacrosse, and games were usually preceded by solemn rituals and dances. 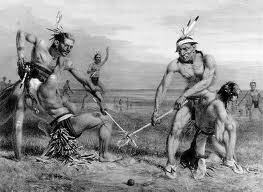 White settlers in the early 17th century gave lacrosse its European name. French Jesuit missionaries felt that the stick used in the contest resembled the type of staff, or crosier, carried by their bishops and known, in French, as la crosse. From then on, baggataway went by the name lacrosse. The original equipment used by Indian tribes was quite simple. The lacrosse stick was a wooden shaft, curved at the top, with leather netting woven into the curved section and used for catching and throwing a ball. Materials used for balls included rocks wrapped in animal skins; carved round pieces of wood, or other available round items. The strategy of each player, originally, was to incapacitate as many opponents as possible with his lacrosse stick and then try to score a goal. Intertribal games of lacrosse were played for many different reasons. Disputes between tribes were often settled on the outcome of a single match, and the sport was used as a means of training young warriors for battle. The games themselves could vary from contest to contest. Some were highly structured, with only five to six players to a side, and boundaries clearly defined. Others could involve nearly a thousand players, with tribal villages serving as field boundaries and play lasting for days. Injuries and even deaths were not uncommon during these mass contests. Not surprisingly, the word "baggataway" literally means "the little brother of war." 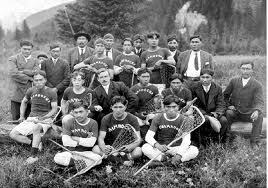 Lacrosse, as we know it today, began to be played around 1840, in eastern Canada, near Quebec and Montreal. So popular was the sport that, in 1867, the Canadian Parliament declared lacrosse (not hockey) as Canada's national game. Lacrosse is unique to American athletics, yet it combines many of the best elements of other popular sports. For example, the physical demands of lacrosse are remarkably similar to those required for football, while ist individual and defensive team concepts somewhat parallel those of basketball. The free-flowing nature of the game, from offense to defense, over the vast expanse of a large field, closely resembles soccer. And the speed of ball movement and the ability of teams to attack from, and defend the area behind the goal, echoes the play of hockey. The emphasis on speed, quickness, anticipation, and transition makes for a great spectator sport, and the fact that every player handles the ball and must have a basic understanding of both offensive and defensive skills adds to the game's complexity. Lacrosse puts a heavy emphasis on team play and group coordination. Yet, within its framework, there is plenty of room for individual initiative and creative expression. Many modern lacrosse purists argue that lacrosse is "the oldest and fastest game on two feet." Whether or not their claim is true, one thing is certain: lacrosse as it is played today is good, clean, hard and skill-intensive fun.